Franco's Barbering Lounge | Looking for long to short hair restyling for men in Bristol? Read this! With the start of a new year, many clients think about changing their look – and one recent client came into our Gloucester Road barber salon looking for a long to short hair men’s restyle in Bristol last week. The client travelled 40 miles from Swindon, after finding one of our blog posts whilst searching on Google for advice and help on men’s hair restyling. He booked online and made an appointment before coming to see Franco. 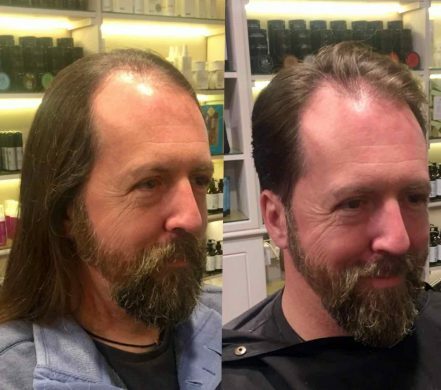 Having not had a trim or haircut in over 12 months, the client was looking for a men’s hair restyle and was very conscious of having longer, thin hair. Following a major hair consultation, three different looks were tried during the long to short hair restyling, until the final agreed look was delivered above. The restyle was achieved using scissors all over, giving a softer look, whilst trimming the back and sides, keeping length on top, and then trimming the beard as well to provide a clean, sharp finishing touch. TIGI Totally Baked was applied to give extra volume on the front, with American Crew Texture Lotion added. This light cream helps to control hair frizz, whilst adding easy hair maintenance for the client. The look was completed within an hour, and cost the client £45. This was a big step for him, especially as he’d never visited us before and had travelled from another county to experience Franco at his very best. To book online for a long to short men’s hair restyle, please visit here. To keep up-to-date with the latest men’s haircuts and male grooming tips from our team of experienced Bristol barbers, please visit our barbering blog here.